When I was a kid, it seemed like every other kid was alllllllllll about that chocolate milk life. Not me. I wanted to chug strawberry milk by the gallon. Back then, I thought the way to make strawberry milk was to squeeze a yellow bottle of factory-made syrup into my cup. Now that I’m older and wiser, I know that yellow bottle of syrup contains exactly 0% strawberry. I wanted to make myself a genuine homemade glass of strawberry milk bursting with real strawberry flavor. I was blown away by the result. It was so good that even Janette, who supposedly hates strawberry milk, will regularly ask me to mix her up a glass. Place strawberries, sugar, and water into a saucepan. Bring to a boil, then reduce heat and simmer for 10 minutes. Pour into a blender and puree. Place puree in a jar, then seal and refrigerate until cold (30-60 minutes). 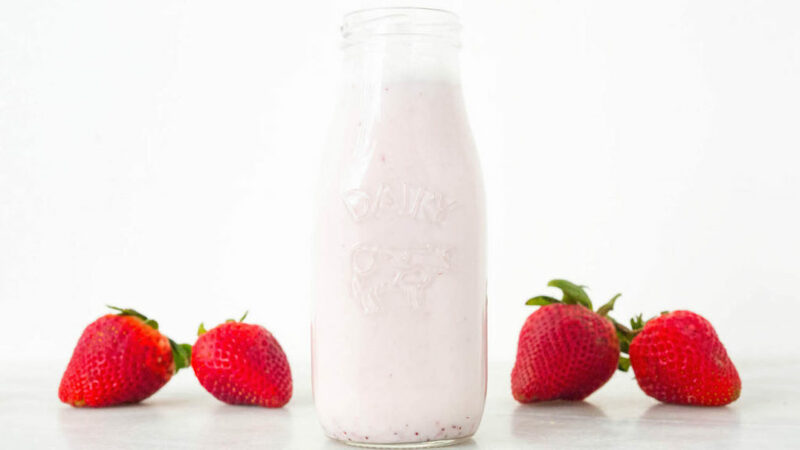 When ready to make strawberry milk, add 3-4 tablespoons of puree per 8 oz of milk. Stir well, then enjoy! 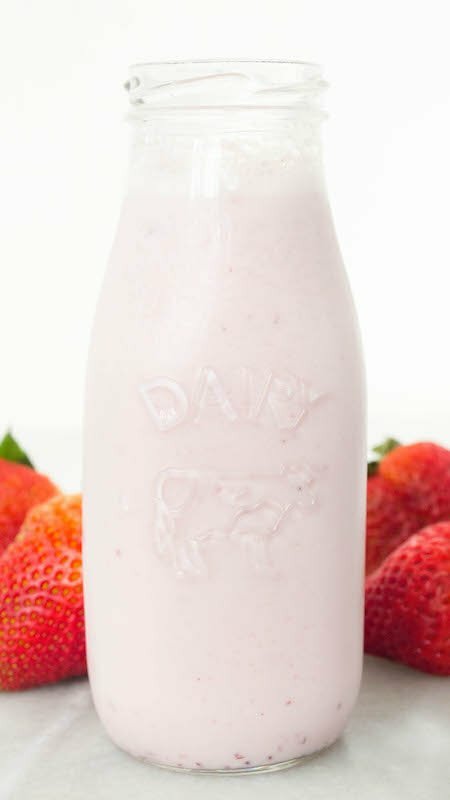 This strawberry milk looks luscious! I think if we looked at a bunch of stuff that we drank or ate as kids, we would run screaming down the street. That’s what’s fun about being an adult, we can develop yummy and healthy recipes that would put the things we used to love to shame! Delicious milk recipe! Great you included strawberries! I also made a strawberry milk. Next time I will try to make it vegan. super delicious! It was a little warm but we just stuck some ice cubes in, great recipe and instructions!